With recent news of self-driving cars, we saw a great and fun opportunity in developing a vehicle that could be controlled hand/arm motion. Being able to control a car from a distance gives a feeling of wonder and maybe even superpower that we never had but might wish to have. We first played around with the Myo's MyoConnect to get a feel for the product. We then incorporated and developed Myo's arduino library into our arduino code in order to control LED's/ motors and other components. Using a lot of Electrical Engineering knowledge, we were able to wire all the physical components and develop a circuit diagram for our MyoMobile. We use our engineering creativity to develop a cardboard prototype of the car. The first challenge we ran into was interfacing the Myo and Arduino. We learned the library and was able to use all 5 poses (grip, wave in, wave out, finger tap, open hand) to output signals to our Arduino. The second challenge was gathering parts as MLH provided some basic electrical components but lacked others such as diodes, and motor drivers. We had no wheels or car frame so it was hard for us to show an actual car moving yet we made wheels out of cardboard and taped it onto our Myomobile. Also, lack of sleep made it very tiring. Interfaced the Myo with Arduino source code to turn on motors and LED's. Developed a working prototype despite lack of physical components and parts. Finished despite lack of sleep and being super tired. 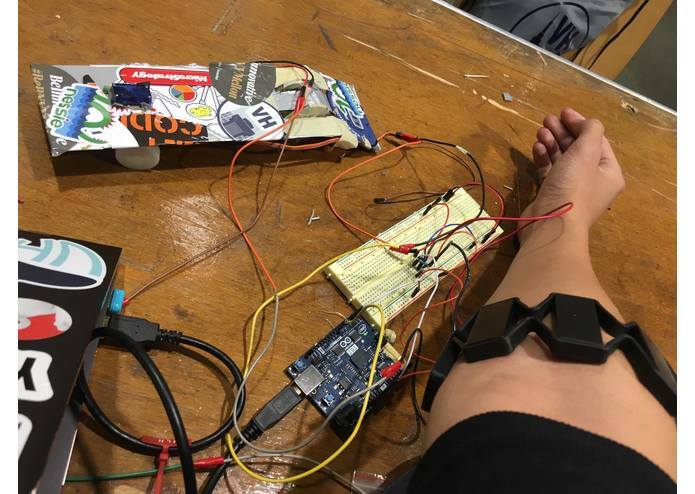 Learned how to interface Myo with Arduino Code and can use movement to control IOT devices. The Myomobile's next step is for it to become wireless. Thinking of integrating a wifi or Bluetooth module to allow wireless communication between the Myo software/ command line and the arduino. Also, we will buy parts (car frame, wheels) to allow a better looking prototype. Worked on the integration of Myo interface with arduino as well as the circuit design and wiring of the final product. I worked on helping circuit design and design layout of the overall car, making the wheels and frame. I also helped in the design of the overall car, making it look sleeker and nicer.